A few months ago my colleague asked me to try out TOra (Toolkit for Oracle). I downloaded the latest stable version of TOra (2.0), and get it installed in my PC. Desperate for guidance, I lurked at TOra’s community forum looking for one. I found a number of questions from people who apparently have the same problem as mine. I tried the tips given there, but I still unable to get TOra connected. I stopped my experiment with TOra because my colleague suggested us to settle with Oracle’s SQL Developer instead. I noticed that SQL Developer is a Java-based Windows application, so I already anticipated that it is going to be much slower than native Windows application. I installed TOra (the latest stable version is still 2.0) and then visited TOra’s community forum for clues. Then I found out someone mentioned that TOra 2.0 was build based on Oracle Instant Client 10. Hmm.. I am still using Oracle 9.2 Instant Client. This could be the main cause why TOra unable to connect. Unfortunately, I am still unable to use TNS record to get TOra connected. I’ll update again once I have success getting TOra connected using TNS records. Once you’ve done above steps, a new connection provider [Oracle (TNS)] will be available. Thanks a lot. Because recently I migrated from TOAD to TORA and came across issue as that of you. Really this blog helped me. Thanks a lot for this block i have googled a lot!! Hi and thanks for the help. I found that installing the windows version of Tora 2.1.1 from the ZIP file and then copying the instantclient 11.1 into the Tora directory worked for me (it replaces the oci.dll file). I found I had to unzip the instaclient 10.2 into my Tora directory then I could connect using TNS or with instaclient. Thanks. Followed yr description to make it working. This works for me using oracle client. Thanks! extract in one folder. copy the file extracted from instantclient-basic-win32-10.2.0.4. Follow the screenshots and it works.. Mine Tora version is 2.1.2. And I am not able to connect to Oracle database. Getting “ORA-30354264” error. I have set both the environment variable on windows machine. 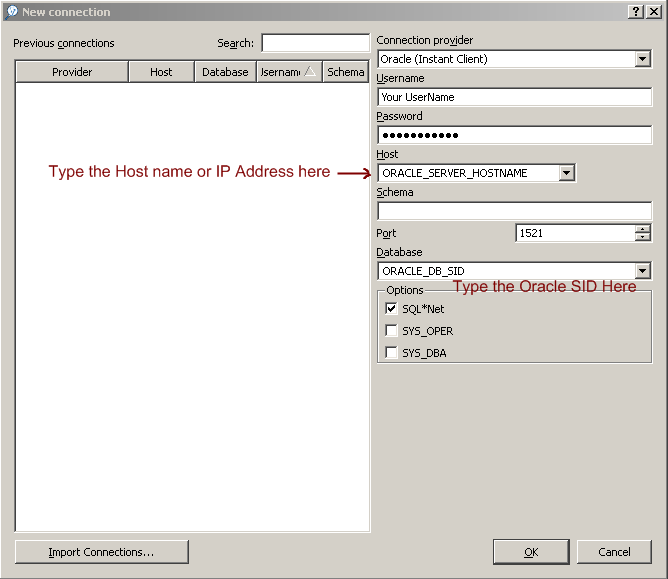 hi, Iam using Oracle – OraDb11g and getting getting this error message. in addition, provided I already populated the correct parameters using Oracle(TNS) un connection provide ..etc. You don’t know what your are talking about. You are not using the tnsnames.ora file, you use easy connect.